With the help of Puzzle-Generator you can easily build your own word search puzzle in a few steps - with individual words. The result can be formatted in a modern way. Generate a great puzzle with your individual touch. Use it for the wedding newspaper or as a gift for birthday or Christmas. After download and installation, start the Windows program Puzzle-Generator from the Start menu. Use the menu item "File → New Puzzle" or the corresponding toolbar button to create a new project. A new dialog window opens where you can select the appropriate type of puzzle "Word Search Puzzle". A blank puzzle is generated and the program interface changes. You need to define the words for the fields in the word search puzzle. This can be done in the editor under "1. Enter Words". After you have entered all words you can start the generation of a new word search puzzle. Switch to the tab "2. Generate" and set the size of the puzzle grid, for example 16x16. Choose whether words may be written backwards. You can also specify which characters are allowed to fill the rest of the grid. In this step the word search puzzle is generated. Navigate to the tab "2. Generate". When the generation process has finished a preview of the created puzzle appears on the right. 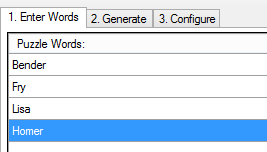 Below the Generate button you will find further details about the result (number of used words, used fields...). With Puzzle-Generator it is possible to customize the look of your word search puzzle in several ways. Select the tab "3. Configure" and go to the settings fields. Configure colors, size, boxes, fonts and much more. Choose a smooth gradient as background. Play around with the settings of Puzzle-Generator. Once you have a word search puzzle generated you should back up your work and save the project. Select "File → Save" or the corresponding toolbar button to save the current puzzle in a file. You can restore the file via "File → Open" and continue editing. To print your word search puzzle just navigate to "File → Print" or the corresponding toolbar button . Do not forget to select your printer in the Print dialog! Use the "Export" button to save image files (such as JPG, PNG or BMP) which you can open into an image -processing or page layout tool. Use the menu item "Options → Save Word Document" or the corresponding toolbar button to save the puzzle as a Word document (.docx). The .docx file can then be opened with Microsoft Word for further editing.